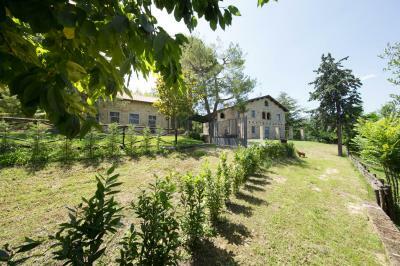 In the countryside of Monte Giberto, among the rolling hills, renovated Country House for Sale of about 260 sqm with large garden. The house has been completely renovated on 2002 by the current owner, taking care of the details and the principles of Feng-Shui. All of this things gave to the building a balance of colors and lights perfect for enjoying the natural environment in which it is located. Coming to the house you will immediately notice a beautiful and spacious porch south facing where to stay and dine on hot summer days. From the porch is accessed directly inside the house where has created a large and bright living room with fireplace (with original vaulted ceilings), kitchen, one bedroom, bathroom and an utility room (or bedroom if necessary) as well as some external storages. The first floor can be reached through elegant internal staircase, where they were created four bedrooms, a luxurious bathroom, closets and a cosy living room. Two of the bedrooms have a balcony. The current owner has also recently installed a pellet stove for global warming the house, as well as fireplace that produces hot air in the lounge room on the ground floor. The property has all services, including the internet and TV. 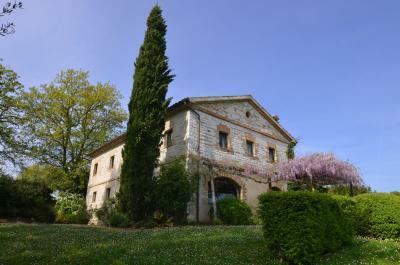 The house has a large garden of about 6000 m² with numerous olive trees, vegetable garden and fruit trees. The property is located at the end of a small country road a few kilometres from center town and from the Adriatic Beach, ideal for those who want to live in harmony with nature and tradition.